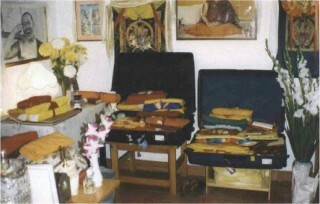 Disciples would be known by the calluses on their shoulders caused by the weight of the guru’s hand luggage. The land was offered before the end of the course and the students formed an organization to assume the remainder of the mortgage. Robbie Solick rented a big American car for Lama and together with Anila Ann, who had recently returned from Australia, they drove to Boulder Creek with a small convoy of students to inspect the site. “I’d gotten to the point where every button of my North American automobile-scare lifetime of experience was being pushed by Lama’s driving and my hair was practically standing on end,” said Anila Ann. Miraculously, the party arrived in one piece, and after booking into a motel they braved the equally perilous drive along a barely existing track to the land itself. “Oh dear, this is my interpretation of jungle,” Lama Yeshe said as he walked around. The indomitable Anila Ann once again volunteered to be the pioneer nun at the new center. Lama asked where the boundary line was, and went running up to the highest point on a steep ridge. The land was almost vertical in parts. Then and there, Lama gave a teaching in a small Redwood grove on the property. “I was trying to find out where he wanted the gompa built,” Ann said. “Lama insisted we start planting things right away. He wanted lots of flower gardens and tended pathways built where people could do walking meditation. His final judgment on the place was that it would make a good retreat center, but not a main center,” she said. Gripped by the pioneering spirit, a bunch of students hastened to set up camp in this majestic Redwood forest. Among those prepared to forego all manner of comforts to labor in the wilds were John and Elaine Jackson. They sold their home, and with their children, aged five and two, set about building a new life on this rugged, uncleared land. Anila Ann, the Brookes, John McKay, Chuck Thomas, Tom Waggoner, Jacie Keeley, and five others followed suit.